Flavors of Thailand: Kaffir lime leaves and red curry paste making music together. A few days ago Ben and I ordered food from Song, a Thai restaurant ranking high on Yelp as one of the best in Park Slope. I hate to report that it was a big disappointment; the green papaya salad was way too lemony, lacking fish sauce and heat, and the other dishes were either too sweet or bland. If you’ve been to Thailand, you’re probably a som tam (green papaya salad) and pad Thai snob like we are. I spent almost a year in Bangkok tasting some of the best food I’ve ever had, so you can understand my frustration when a mediocre version of something that should be exceptionally delicious (like som tam) is presented before me. 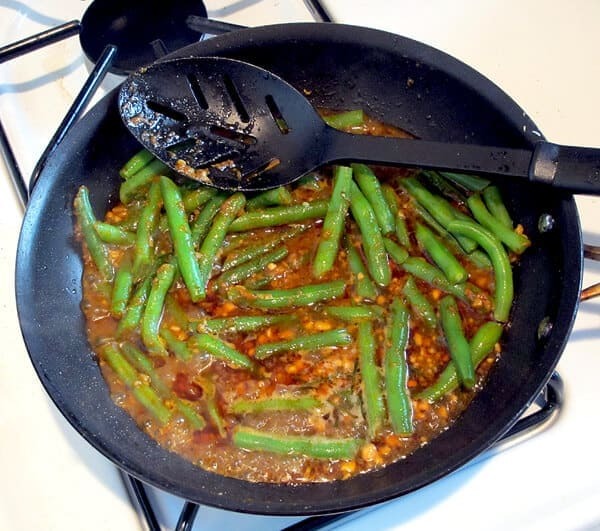 Cooking green beans in water is known as blanching. This process makes their natural green color pop out. This week, instead of risking another disappointing Thai delivery order, I took it upon myself to whip up a few dishes since Thai food really isn’t that complicated. What’s needed are basic ingredients like fish sauce, Thai chilies, curry paste, galangal (or ginger), holy basil (or regular basil) garlic, sugar, lemon and soy. Lemongrass is also often used though just like lime kaffir lime leaves and coconut milk, isn’t always needed. 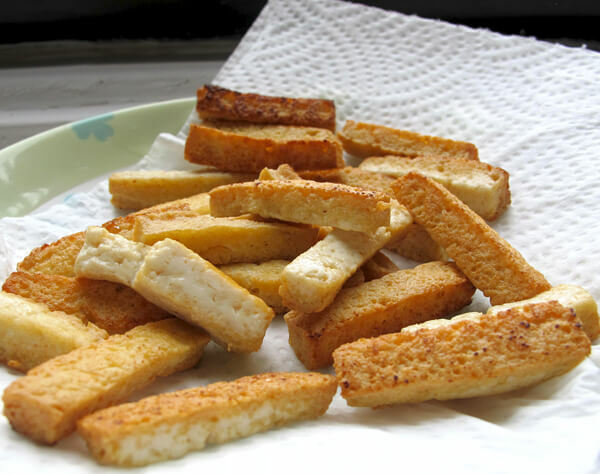 Frying tofu adds a soft crunch and vibrance to the dish. I made a ginger shrimp stir fry, scallops with vegetables in oyster sauce and this tofu green beans with red curry sauce. No meat for this dinner extravaganza, but plenty of yummy seafood and beans of all kinds to keep our skin aglow! You’ll need kaffir lime leaves for this recipe which you can usually find in Asian grocery stores. Better yet, if you can drive to a Thai supermarket, they’ll definitely have them. I get mine at Bangkok Center in Chinatown. They’ll keep for a long time if you put them in a ziplock bag and store in the freezer. 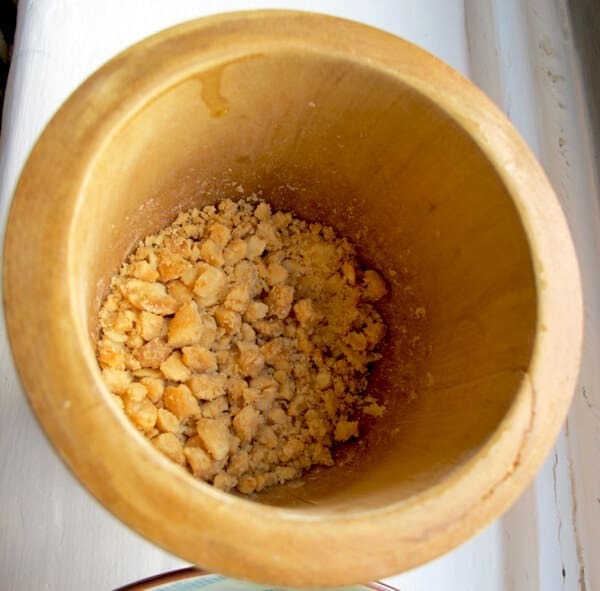 Pestle and mortar are often used in Asian cooking to crush and grind herbs and spices. 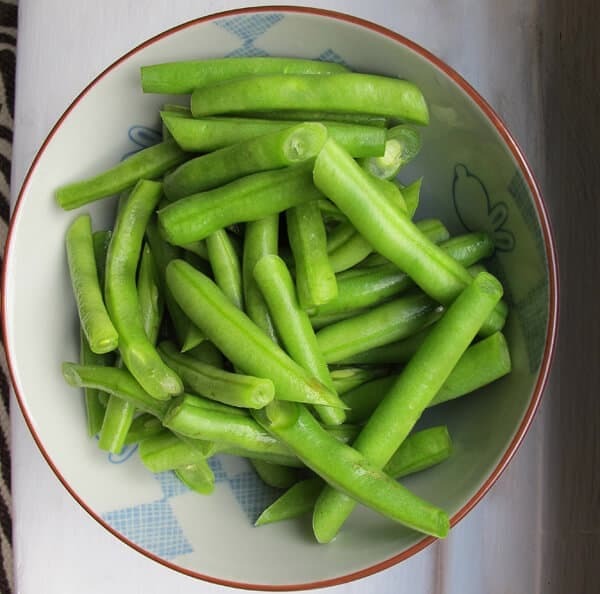 Peanuts are also common in Thai cooking though unlike Indonesia and the Philippines, where they are used to make sweet sauces, are served in their natural state, or crushed like in this tofu green beans recipe. If sweet peanut sauce is served with your Thai food, it’s a sign that you’re ordering or eating at a Thai/ American fusion restaurant (as it will never make an appearance in any dishes in Thailand). Getting in the habit of prepping and having all the ingredients ready to go before cooking, saves time and helps keep the kitchen clean. 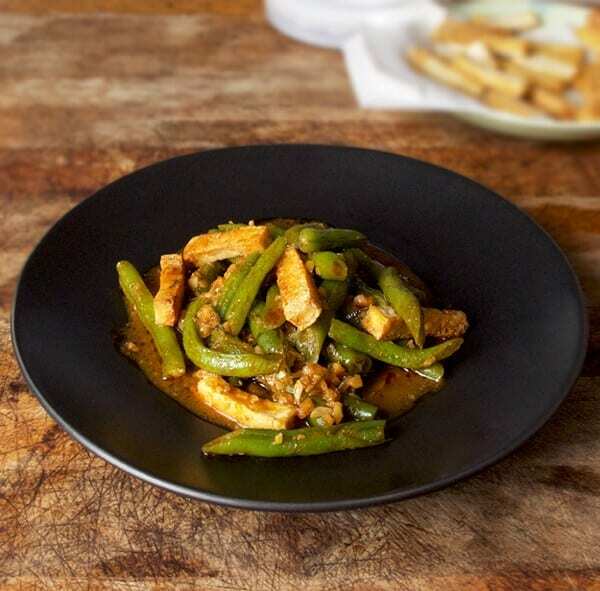 Tofu green beans with red curry sauce is a very simple and very authentic Thai dish. If you like strong, punchy flavors, you’re going to LOVE this dish! Quickly fry all the ingredients and serve this authentic Thai dish with a bowl of steamed rice. Spicy and salty green beans with sliced tofu. Bring a small pot of water with salt (about 1 teaspoon) to boil. Add green beans and cook for 3 minutes. Drain and rinse in cold water. Set aside. Use about 1/4 cup of vegetable oil in a medium size pan and wait until the oil is very hot. Carefully add tofu strips and cook until they are golden brown on the outside. Drain on a paper towel and set aside. 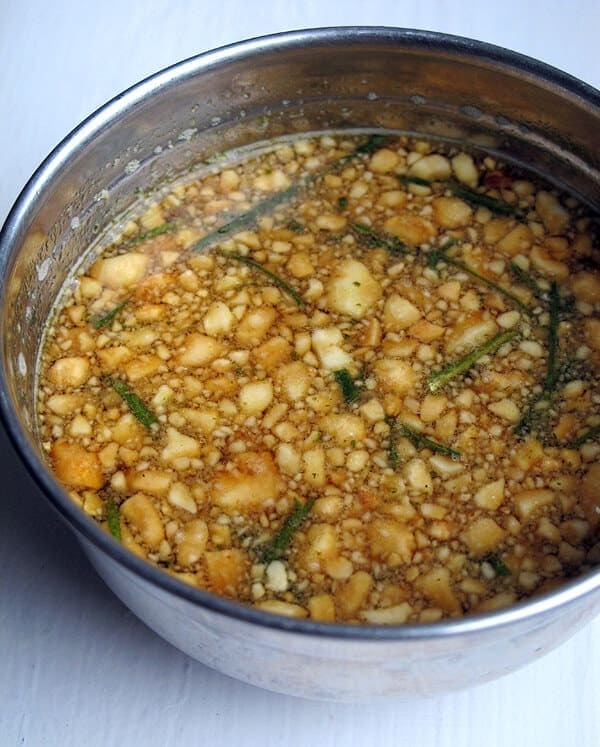 In a small bowl, mix the soy sauce, sugar, vegetable broth and kaffir lime leaves. Set aside. In a large pan over high heat, add 2 tbsp oil and garlic. Cook for a minute and add red curry paste. Mix well. Add green beans and sauce. Stir well. Add tofu, quickly stir and serve with rice. Be careful when adding tofu to hot oil as some drops of oil may splash back.